Closest rafting to Gatlinburg and Pigeon Forge. Family fun for children as young as 3! This trip is an amazing outdoor experience on the 5.5-mile Lower Pigeon Rafting Trip. Great for young children or those looking for more of a float trip. 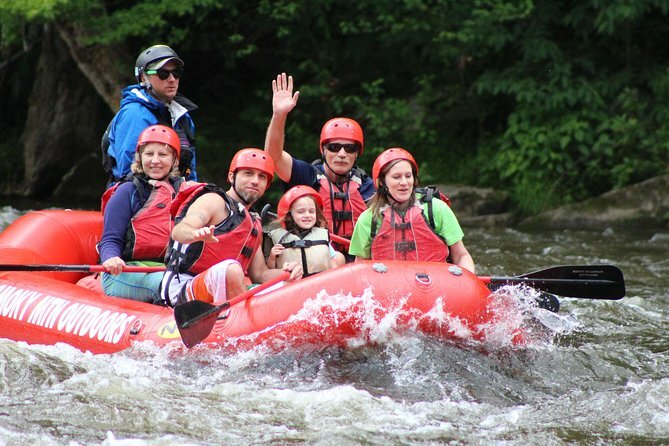 Rafting on the lower Pigeon River is one of the best attractions in Gatlinburg, Tennessee. It's a 5.5-mile trip through the scenic Pigeon River gorge. This adventure begins at the outpost and ends at the Denton Bridge. From there we bus you back up to the outpost. During your Pigeon River rafting trip you will run about 50 Class 1 and 2 rapids with one Class 3 at the end. Water fights and splashing are very popular on the lower Pigeon River. There is a guide in every raft. You will be provided with a lifejacket, helmet, and paddle for every rafter. Operates: We offer Lower Pigeon afting trips Tuesday, Wednesday, Thursday, and Saturday from Memorial Day - Labor Day. Spring and fall trips are subject to weather and water availability.